Dream Home - Invited some currently renovating and fanatics of the block around for a game of Dream Home. Seemed fitting for them and even though we've played a few board games in the past together, the theme of building a home and the colourful presentation really seemed to win them over. Unfortunately having played about a dozen games now, I've already noticed a bit of the charm starting to wear thin. Is a good game for the casual crowd and would be easy to convince most to give it a go - but there isn't enough going on to really hold my interest beyond a simple gateway filler. T.I.M.E Stories: A Prophecy Of Dragons - Second play of this one after really enjoying last weeks first trial through of this scenario. I feel like I get the same feeling everytime we have our second play. We take our time and get immersed on the first play and the second one we spend so much time before hand coming up with a plan but never seem to enjoy it as much as we've seen all the art work and spend the game rushing around and questioning each others memory. I still think Prophecy of Dragons is a good break from the usual, but after thinking we had it cracked only to once again anger Bob, our team was a bit deflated that we'll be returning for a third play through. Fairly confident we got it this time and hoping we don't make the same error we do every time and decide to enjoy it rather than rush through. Takenoko - My first time ever playing Takenoko after constant debate of whether I needed it in the library or not. It didn't disappoint. 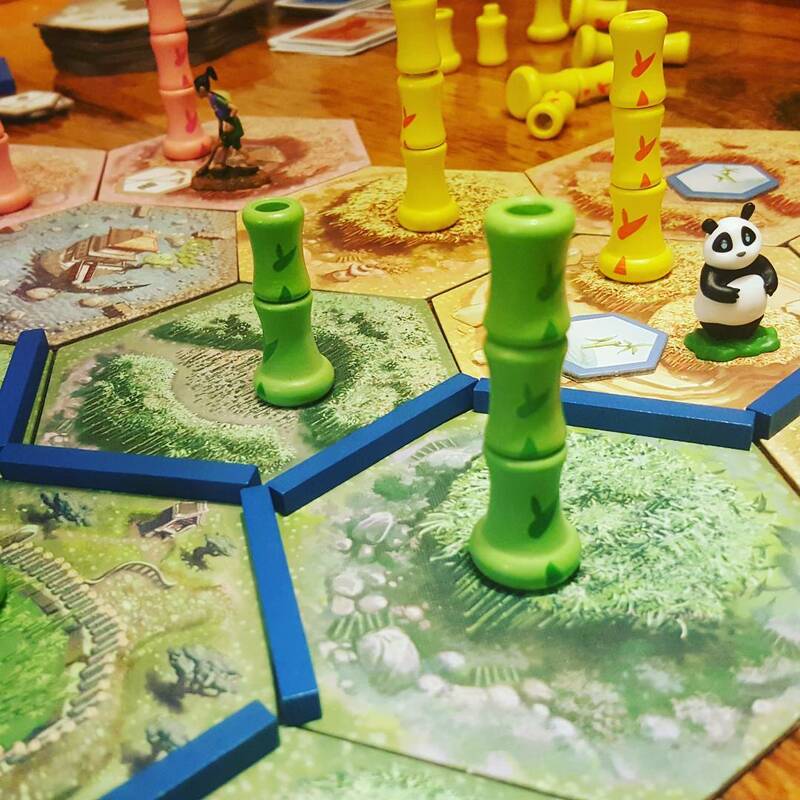 Takenoko is just as good as it looks and I personally (along with most others I'm sure) find this a very good looking game! It oozes with charm and a bit of culture to go with it in a beautifully presented tile placement / action selection light strategy game. It's a 30 minute relaxing experience as you grow and water the Palace garden, while a Panda roams around eating the bamboo you've just grown. Even without the Panda, Takenoko would be decent. Adding the Panda just makes this a winner and one that I'll bring out for a while to come, even if its just to show off this colourful garden world. Doom - This is one epic game that didn't hang around that long. It looks amazing, has tonnes of miniatures begging to be painted, and features an all vs one mechanic that I really enjoy. However, I realized a while ago that you can only have too many of the same type of game as realistically you'll mostly play the one you like best. Doom almost fills a niche, but I have a few similar type games so I decided to give it to a friend for his birthday who often plays board games with us but has a smaller collection himself. He was pretty pleased, so I'm happy to see it go to a good home and know I'll be around to play it at his place anyway. Two birds with one stone - smiles all around. Sons Of Anarchy Men Of Mayhem - I really enjoyed the first couple seasons of this show, and while I stayed until the end I was less and less interested with what was going on in the far fetched adventures of the Sons Of Anarchy. Licensed board games are often just good for fans of the content and I wouldn't really put myself in the big SoA fan category, so why did I purchase the SoA board game? Read a couple of reviews. For a licensed game, this one seems to have got it right with the game play and mechanics before adding a theme. It's a worker placement game but with lots of bits of action going on at the same time that make it seem much more involved. I'm not rushing to get this to the table, but know eventually I'll get around to giving it a go and secretly (or not now that I've just told everyone..) I'm hoping that I'll end up loving this. Unlock: The Formula - I've done one escape room hand cuffed to two other people and after 60 minutes of puzzles and fun, we just managed to escape as the clock was about to expire. At the end we still had one key on us that we hadn't managed to figure out what it was for - like the idiots we were, we had to ask only to discover we had been carrying around the key for the handcuffs that had made solving the puzzles awkward for the last hour! It was a good memory and something that while I wouldn't often I'd definitely recommend. One of the latest board gaming trends is to replicate that experience through puzzles in a board game. I'm not convinced on the immersion of being locked in a propped out room will be felt just through reading cards, but I'm curious enough to want to give it a go. Dunno why I started with this one and it was a tough choice between the Unlock and Exit series, but ultimately I settled on the Unlock one so I can loan it to someone else to have a go after. Hey, That's My Fish - Small, cheap and a classic for all ages. Did I need this game? Definitely not, but while I've already paid for the shipping why not add a smaller affordable game or two (Timeline Music & Cinema being the other one). I know this is just a simple game but aside from the complaint that it takes just as long to set up and it does to play - everyone seems to enjoy it. Don't imagine I'll see it out often, but its good to have something like this in the library for some of the younger games and that alone was enough for me to click on the 'Add to Cart' button.